Help us set the World record for the most skiing Santas! 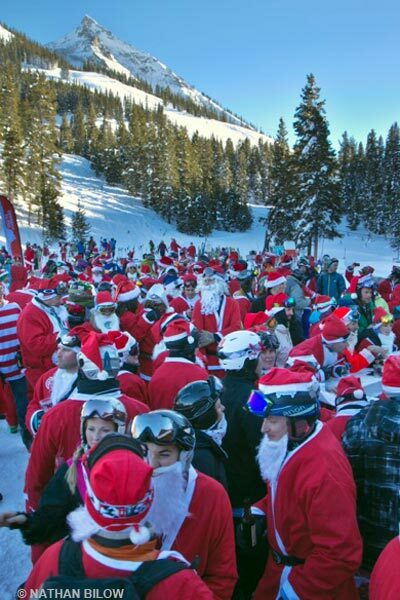 Once again Crested Butte Mountain Resort is hosting its 6th annual “Santa Ski and Crawl” in hopes of breaking our World Record for the most number of skiers, boarders, and bladers in full Santa costumes. It doesn’t matter if you ski, snowboard or snowblade, all Santas are welcome! The Santa Ski is open to all ages and is free to participate in. All you need is a Santa suit and either a season pass or a lift ticket for the day. Discounted Santa lift tickets are available at Crested Butte Rental Center in the middle level of the Treasury Center. Participants must be decked out in a full Santa suit in order to be in the group Santa Ski at 3:30 PM. Don’t have a Season Pass? – You can hit the slopes for only $40 if you’re in a full Santa Suit that day! Santa suits must have a top, bottom, hat and beard in order to qualify. You can make your own suit, use an old one or purchase one in advance from www.cbsantacrawl.com. CBMR will also be offering amazing discounts on lodging, so Santas can spread their holiday cheer into the Crested Butte night after a fun day on the slopes! Check out www.cbsantacrawl.com for details!